The first surprise of this World Cup Edition as the Dutch edges the World Champion by 4 goals difference. 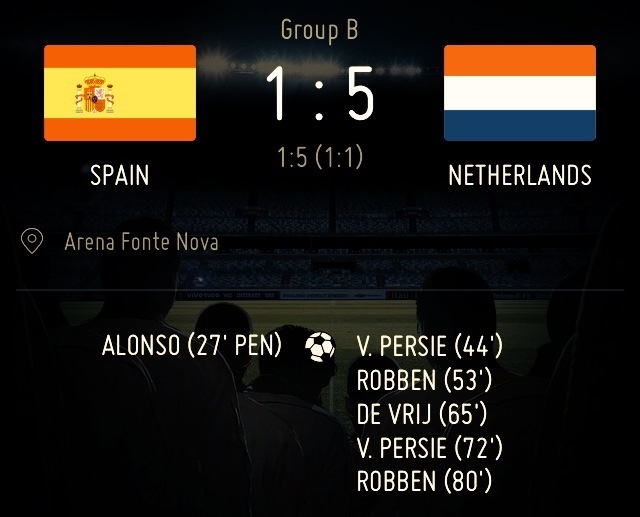 Spain took the lead in 27′ with penalty from Alonso, but later suffer 5 goals from the Oranje. It was one of their biggest defeat since 1950. Van Persie was named the Man of the Match, but I personally opt for Robben, who extensively occupied the pitch, especially with his second goal which humiliate Casillas.